Katherine and I recently got chatting over email. Sadly we have a lot in common. Her husband Wesley died unexpectedly on 30th March this year at just 37 years old. She is now raising her young child Julia as a sole parent. She has also started a blog to share her experiences of life as a widow. I asked Katherine to write a guest post about the role of faith in her grief. Many people have written to me to say they wish they had religion to see them through. Katherine does and she articulates what it means to her so beautifully here. I first heard those stirring words sung as I stood beside Wesley on April 24, 2004, our young hands shaking with joy as we walked out of the church proudly as man and wife for the first time; him in a neat black tuxedo and me in an impossibly heavy and beautiful white gown. Our eyes shone with love and hope as we imagined our lives stretching ahead of us. We would have babies; our babies would have babies and we would fill our lives with family, careers, travel and the days that seamlessly flow into one another. Boring and mundane would be our existence. We were 25 and 28 years old and we could feel ourselves at the precipice of our life together truly beginning. The next time I heard those beautiful words I wore not a white gown, but a tailored navy suit and although I was once again in a church, Wesley was not tightly clutching my hand. My beautiful husband, who I had dreamt would grow grey and paunchy beside me as years passed and would chase squealing and laughing grandchildren around our front yard pretending to be “Papa Bear”, was dead. I was a 34-year-old widow with a three-year-old daughter facing a future I could not begin to understand. Wesley became sick on Good Friday with what we thought was a stomach bug and he was dead by 7:30 a.m. on Holy Saturday. The confused call to 911 to say he seemed dehydrated and I could not carry him to the car; the moment where I realized he had stopped breathing as he overlooked the beautiful lake that our home faces; the sterile and empty waiting room at the hospital where the emergency room doctor tenderly told me that Wesley was gone while my brother and his wife sobbed is all a blur. At first we did not know what Wesley had died of as he was a healthy young man…heart attack? Stroke? And finally the shocking diagnosis of Acute Myeloid Leukemia which none of us, including Wesley, knew he had raging in his body. Incredibly aggressive, it appears Wesley had leukemia for possibly a couple of months, but more likely weeks. It was fast, painless and he was blissfully unaware that he was leaving his young family to cross the gulf to Heaven. We are a religious family. It always feels oddly smarmy and a bit like a Holy Roller to say that but we are Christian and believe in the role of God and Jesus in our lives. Not trying to convert anyone as we believe that living a daily Christian life is better than knocking someone over the head with the King James Bible. A relationship with God, or lack thereof, is intensely personal and private. Or so say I. Faith brings myself and our little girl Julia comfort in a situation where the ground below us seems shaky and unsteady. When I told Julia on Easter morning that Daddy had been very sick and had gone to live with Jesus in Heaven, but that he lived in our heart like the Holy Spirit forever, these were all common words and concepts for her. That I had the religious lexicon to utilize and in some ways had been preparing her and myself in a way I could never have imagined for this conversation. Even his death over Easter was comforting as Julia believes that when Jesus rose to Heaven, he took Daddy with him. And perhaps he did. The image of Christ helping guide Wesley to Heaven is very peaceful and comforting to us. We talk about what Wesley is doing in Heaven. Eating doughnuts with Jesus, taking Julia’s teacher’s deceased dog out for a walk and other every day activities provide a link and conversation where Wesley is as present if he were at the table with us. Wesley is not physically with us, but he is a vibrant presence in our home and lives. But for many people who are religious and lose someone they love, the role of faith and religion is a very important and sometimes challenging role in their grief. It is like a puzzle where one recognizes the colors and shapes on the pieces but cannot figure out what the picture is. It can rock someone to their core and I too found myself trying to bargain with God. “I’m a good person, I have weathered this trial with grace and poise and have helped shepherd Julia through the loss of her father…now let’s return to regularly scheduled programming.” But there is no give and take and for one of the first times in my life I’m not going to negotiate my way out of this. It is a cold splash of water to realize that while I might want to sit and parlay with God, he is not going to take my meeting. But I am not being left lonely in the waiting room with lukewarm coffee and old magazines either. I cannot find comfort that Wesley’s death is part of “God’s Plan” because I do not feel that a 37-year-old man dying of a senseless disease is in the plans of anyone, human or deity. But I do believe that God has placed every mercy in my way. We recently moved back to my hometown so I am surrounded by familial support and the love of childhood, college and newer friends, my career is very stable and they are incredibly generous and understanding that my life has dramatically and irrevocably changed. If God could do nothing to change the events on March 30th he has provided a road that while hard and rocky has a well-worn path. But still. But yet. My life is never going to be the same and it at times makes me want to scream at the heavens that I did not deserve this. Why my husband? Why my family? “The time when there is nothing at all in your soul except a cry for help may be just the time when God can’t give it: you are like the drowning man who can’t be helped because he clutches and grabs. Perhaps your own reiterated cries deafen you to the voice you hoped to hear. God wants to help us. He wants to provide peace and solace, but as I’m screaming and clawing at the door of death that separates me from my love, I cannot hear the soft and steady whisper of “Peace, my love. Peace” I am batting away caresses of comfort and reassurance in my flailing grief. But when I’m quiet and when I’m still, I can hear and feel God’s comfort and love. Wesley is with me, I just have to stop to listen and sit quietly to feel him. We all have our loved ones who have passed on with us, we just need to close our eyes and listen with our hearts. Our broken and hurting hearts. What a beautiful photo that she will cherish as she grows…not her daddy, but at least a visual reminder of his love for her. I am so sorry for your loss. You are obviously brave and strong. It has taken me almost 4 years to write of my husbands year-long battle with AML and now I’m working on our memoir. I will visit your blog, you are welcome to visit mine. Thank you, Ben, for inviting Katherine to guest blog here. A beautiful post. So sorry for your loss Katherine. Praying for you, your daughter and your family. Ben I am praying for you and Jackson too. Thank you so much for the opportunity to share a piece of my story, Ben. I think it is so fitting that it was posted not only on Sunday but on Wesley’s birthday. 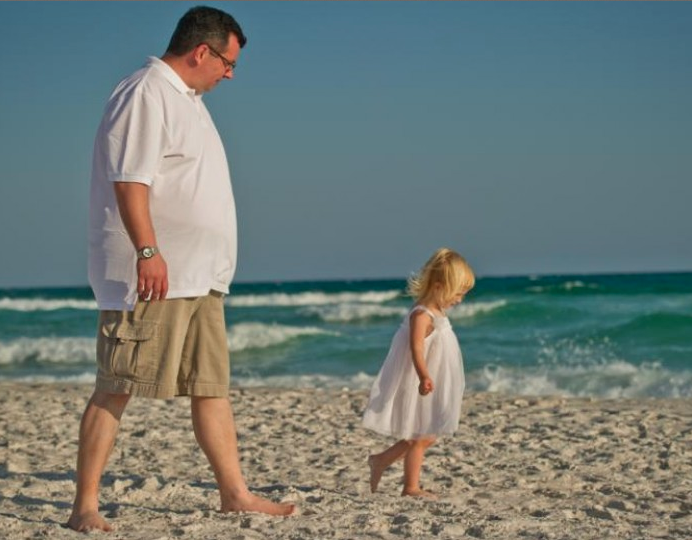 This entry was posted on July 14, 2013 by Ben Brooks-Dutton and tagged bereavement, children, daddy, faith, grief, guest post, life as a widower, lifeasawidower, loss, marriage, religion, widow.